A transformer is a device that transfers electrical energy from one circuit to another by magnetic coupling without requiring relative motion between its parts. It usually comprises two or more coupled windings, and, in most cases, a core to concentrate magnetic flux. An alternating voltage applied to one winding creates a time-varying magnetic flux in the core, which induces a voltage in the other windings. Varying the relative number of turns between primary and secondary windings determines the ratio of the input and output voltages, thus transforming the voltage by stepping it up or down between circuits. The transformer principle was demonstrated in 1831 by Faraday, though practical designs did not appear until the 1880s. Within less than a decade, the transformer was instrumental during the "War of Currents" in seeing alternating current systems triumph over their direct current counterparts, a position in which they have remained dominant. The transformer has since shaped the electricity supply industry, permitting the economic transmission of power over long distances. All but a fraction of the world's electrical power has passed through a series of transformers by the time it reaches the consumer. Amongt the simplest of electrical machines, the transformer is also one of the most efficient, with large units attaining performances in excess of 99.75 percent. 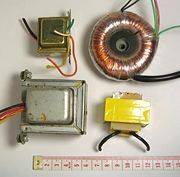 Transformers come in a range of sizes, from a thumbnail-sized coupling transformer hidden inside a stage microphone to huge giga VA-rated units used to interconnect portions of national power grids. All operate with the same basic principles and with many similarities in their parts, though a variety of transformer designs exist to perform specialized roles throughout home and industry. Michael Faraday built the first transformer in 1831, although he used it only to demonstrate the principle of electromagnetic induction and did not foresee its practical uses. Russian engineer Pavel Yablochkov in 1876 invented a lighting system based on a set of induction coils, where primary windings were connected to a source of alternating current and secondary windings could be connected to several "electric candles". The patent claimed the system could "provide separate supply to several lighting fixtures with different luminous intensities from a single source of electric power." 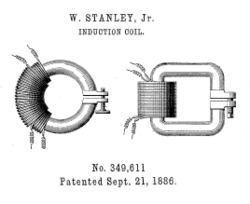 Evidently, the induction coil in this system operated as a transformer. Lucien Gaulard and John Dixon Gibbs, who first exhibited a device with an open iron core called a 'secondary generator' in London in 1882 and then sold the idea to American company Westinghouse. This may have been the first practical power transformer. They also exhibited the invention in Turin in 1884, where it was adopted for an electric lighting system. William Stanley, an engineer for Westinghouse, built the first commercial device in 1885 after George Westinghouse had bought Gaulard and Gibbs' patents. The core was made from interlocking E-shaped iron plates. This design was first used commercially in 1886. Hungarian engineers Zipernowsky, Bláthy and Déri from the Ganz company in Budapest created the efficient "ZBD" closed-core model in 1885 based on the design by Gaulard and Gibbs. Their patent application made the first use of the word "transformer". Russian engineer Mikhail Dolivo-Dobrovolsky developed the first three-phase transformer in 1889. In 1891 Nikola Tesla invented the Tesla coil, an air-cored, dual-tuned resonant transformer for generating very high voltages at high frequency. Audio frequency transformers (at the time called repeating coils) were used by the earliest experimenters in the development of the telephone. While new technologies have made transformers in some electronics applications obsolete, transformers are still found in many electronic devices. Transformers are essential for high voltage power transmission, which makes long distance transmission economically practical. This advantage was the principal factor in the selection of alternating current power transmission in the "War of Currents" in the late 1880s. Many others have patents on transformers. 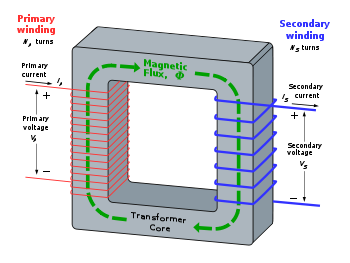 The principles of the transformer are illustrated by consideration of a hypothetical ideal transformer consisting of two windings of zero resistance around a core of negligible reluctance. A voltage applied to the primary winding causes a current, which develops a magnetomotive force (MMF) in the core. The current required to create the MMF is termed the magnetising current; in the ideal transformer it is considered to be negligible. The MMF drives flux around the magnetic circuit of the core. and are the time derivatives of the flux linking the primary and secondary windings. The ratio of primary to secondary voltage is therefore the same as the ratio of the number of turns; alternatively, that the volts-per-turn is the same in both windings. If a load impedance is connected to the secondary winding, a current will flow in the secondary circuit so created. The current develops an MMF over the secondary winding in opposition to that of the primary winding, so acting to cancel the flux in the core. The now decreased flux reduces the primary EMF, causing current in the primary circuit to increase to exactly offset the effect of the secondary MMF, and returning the flux to its former value. The core flux thus remains the same regardless of the secondary current, provided the primary voltage is sustained. In this way, the electrical energy fed into the primary circuit is delivered to the secondary circuit. From consideration of the voltage and current relationships, it may be readily shown that impedance in one circuit is transformed by the square of the turns ratio, a secondary impedance thus appearing to the primary circuit to have a value of . The ideal transformer model assumes that all flux generated by the primary winding links all the turns of every winding, including itself. In practice, some flux traverses paths that take it outside the windings. Such flux is termed leakage flux, and manifests itself as self-inductance in series with the mutually coupled transformer windings. Leakage is not itself directly a source of power loss, but results in poorer voltage regulation, causing the secondary voltage to fail to be directly proportional to the primary, particularly under heavy load. Distribution transformers are therefore normally designed to have very low leakage inductance. However, in some applications, leakage can be a desirable property, and long magnetic paths, air gaps, or magnetic bypass shunts may be deliberately introduced to a transformer's design to limit the short-circuit current it will supply. Leaky transformers may be used to supply loads that exhibit negative resistance, such as electric arcs, mercury vapor lamps, and neon signs; or for safely handling loads that become periodically short-circuited such as electric arc welders. Air gaps are also used to keep a transformer from saturating, especially audio-frequency transformers that have a DC component added. The time-derivative term in Faraday's Law implies that the flux in the core is the integral of the applied voltage. An ideal transformer would, at least hypothetically, work under direct-current excitation, with the core flux increasing linearly with time. In practice, the flux would rise very rapidly to the point where magnetic saturation of the core occurred and the transformer would cease to function as such. All practical transformers must therefore operate under alternating (or pulsed) current conditions. The EMF of a transformer at a given flux density increases with frequency, an effect predicated by the universal transformer EMF equation. By operating at higher frequencies, transformers can be physically more compact without reaching saturation, and a given core is able to transfer more power. However efficiency becomes poorer with properties such as core loss and conductor skin effect also increasing with frequency. Aircraft and military equipment traditionally employ 400 Hz power supplies since the decrease in efficiency is more than offset by the reduction in core and winding weight. In general, operation of a transformer at its designed voltage but at a higher frequency than intended will lead to reduced magnetising current. At a frequency lower than the design value, with the rated voltage applied, the magnetising current may increase to an excessive level. Operation of a transformer at other than its design frequency may require assessment of voltages, losses, and cooling to establish if safe operation is practical. For example, transformers may need to be equipped with "volts per hertz" over-excitation relays to protect the transformer from overvoltage at higher than rated frequency. An ideal transformer would have no energy losses, and would therefore be 100 percent efficient. Despite the transformer being amongst the most efficient of electrical machines, with experimental models using superconducting windings achieving efficiencies of 99.85 percent, energy is dissipated in the windings, core, and surrounding structures. Larger transformers are generally more efficient, and those rated for electricity distribution usually perform better than 95 percent. A small transformer such as a plug-in "power brick" used for low-power [[consumer electronics]] may be less than 85 percent efficient. Transformer losses are attributable to several causes and may be differentiated between those originating in the windings, sometimes termed copper loss, and those arising from the magnetic circuit, sometimes termed iron loss, The losses vary with load current, and may furthermore be expressed as "no-load" or "full-load" loss, or at an intermediate loading. Winding resistance dominates load losses, whereas hysteresis and eddy currents losses contribute to over 99 percent of the no-load loss. Ferromagnetic materials are also good conductors, and a solid core made from such a material also constitutes a single short-circuited turn throughout its entire length. Induced eddy currents therefore circulate within the core in a plane normal to the flux, and are responsible for resistive heating of the core material. Each time the magnetic field is reversed, a small amount of energy is lost to hysteresis within the magnetic core, the amount being dependant on the particular core material. Magnetic flux in the core causes it to physically expand and contract slightly with the alternating magnetic field, an effect known as magnetostriction. This produces the familiar buzzing sound, and in turn causes losses due to frictional heating in susceptible cores. In addition to magnetostriction, the alternating magnetic field causes fluctuating electromagnetic forces between the primary and secondary windings. These incite vibrations within nearby metalwork, adding to the buzzing noise, and consuming a small amount of power. Not all the magnetic field produced by the primary is intercepted by the secondary. A portion of the leakage flux may induce eddy currents within nearby conductive objects, such as the transformer's support structure, and be converted to heat. Large power transformers may be equipped with cooling fans, oil pumps or water-cooled heat exchangers designed to remove heat. The power used to operate the cooling system is typically considered part of the losses of the transformer. The physical limitations of the practical transformer may be brought together as an equivalent circuit model built around an ideal lossless transformer. Power loss in the windings is current-dependant and is easily represented as in-series resistances RP and RS. Flux leakage results in a fraction of the applied voltage dropped without contributing to the mutual coupling, and thus can be modelled as self-inductances XP and XS in series with the perfectly-coupled region. Iron losses are caused mostly by hysteresis and eddy current effects in the core, and tend to be proportional to the square of the core flux for operation at a given frequency. Since the core flux is proportional to the applied voltage, the iron loss can be represented by a resistance RC in parallel with the ideal transformer. A core with finite permeability requires a magnetising current IM to maintain the mutual flux in the core. 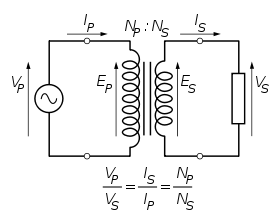 The magnetising current is in phase with the flux; saturation effects cause the relationship between the two to be non-linear, but for simplicity this effect tends to be ignored in most circuit equivalents. With a sinusoidal supply, the core flux lags the induced EMF by 90° and this effect can be modelled as a magnetising reactance XM in parallel with the core loss component. RC and XM are sometimes together termed the magnetising branch of the model. If the secondary winding is made open-circuit, the current taken by the magnetising branch represents the transformer's no-load current. The secondary impedance RS and XS is frequently moved (or "referred") to the primary side after multiplying the components by the impedance scaling factor . The resulting model is sometimes termed the "exact equivalent circuit," though it retains a number of approximations, such as an assumption of linearity. Analysis may be simplified by moving the magnetising branch to the left of the primary impedance, an implicit assumption that the magnetising current is low, and then summing primary and referred secondary impedances. By winding turns ratio: step-up, step-down, isolating (near equal ratio), variable. Laminated core transformer showing edge of laminations at top of unit. Transformers for use at power or audio frequencies typically have cores made of high permeability silicon steel. By concentrating the magnetic flux, more of it usefully links both primary and secondary windings, and the magnetising current is greatly reduced. Early transformer developers soon realised that cores constructed from solid iron resulted in prohibitive eddy-current losses, and their designs mitigated this effect with cores consisting of bundles of insulated iron wires. Later designs constructed the core by stacking layers of thin steel laminations, a principle still in use. Each lamination is insulated from its neighbors by a coat of non-conducting paint. The universal transformer equation indicates a minimum cross-sectional area for the core to avoid saturation. The effect of laminations is to confine eddy currents to highly elliptical paths that enclose little flux, and so reduce their magnitude. Thinner laminations reduce losses, but are more laborious and expensive to construct. Thin laminations are generally used on high frequency transformers, with some types of very thin steel laminations able to operate up to 10 kHz. 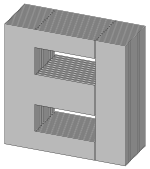 One common design of laminated core is made from interleaved stacks of E-shaped steel sheets capped with I-shaped pieces, leading to its name of "E-I transformer". The cut-core or C-core type is made by winding a steel strip around a rectangular form and then bonding the layers together. It is then cut in two, forming two C shapes, and the core assembled by binding the two C halves together with a steel strap. They have the advantage that the flux is always oriented parallel to the metal grains, reducing reluctance. A steel core's remanence means that it retains a static magnetic field when power is removed. When power is then reapplied, the residual field will cause a high inrush current until the effect of the remanent magnetism is reduced, usually after a few cycles of the applied alternating current. Overcurrent protection devices such as fuses must be selected to allow this harmless inrush to pass. On transformers connected to long overhead power transmission lines, induced currents due to geomagnetic disturbances during solar storms can cause saturation of the core, and false operation of transformer protection devices. Distribution transformers can achieve low off-load losses by using cores made with low loss high permeability silicon steel and amorphous (non-crystalline) steel, so-called "metal glasses." The high initial cost of the core material is offset over the life of the transformer by its lower losses at light load. Powdered iron cores are used in circuits (such as switch-mode power supplies) that operate above mains frequencies and up to a few tens of kilohertz. These materials combine high magnetic permeability with high bulk electrical resistivity. For frequencies extending to beyond the VHF band, cores made from non-conductive magnetic ceramic materials called ferrites are common. 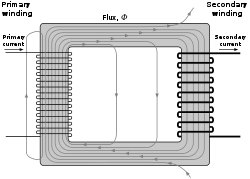 Some radio-frequency transformers also have moveable cores (sometimes called 'slugs') which allow adjustment of the coupling coefficient (and bandwidth) of tuned radio-frequency circuits. High-frequency transformers may also use air cores. These eliminate the loss due to hysteresis in the core material. Such transformers maintain high coupling efficiency (low stray field loss) by overlapping the primary and secondary windings. Various transformers. The top right is toroidal. The bottom right is from a 12 VAC wall wart supply. Toroidal transformers are built around a ring-shaped core, which is made from a long strip of silicon steel or permalloy wound into a coil, from powdered iron, or ferrite, depending on operating frequency. The strip construction ensures that the grain boundaries are optimally aligned, improving the transformer's efficiency by reducing the core's reluctance. The closed ring shape eliminates air gaps inherent in the construction of an E-I core. The cross-section of the ring is usually square or rectangular, but more expensive cores with circular cross-sections are also available. The primary and secondary coils are often wound concentrically to cover the entire surface of the core. This minimises the length of wire needed, and also provides screening to minimize the core's magnetic field from generating electromagnetic interference. Ferrite toroid cores are used at higher frequencies, typically between a few tens of kilohertz to a megahertz, to reduce losses, physical size, and weight of switch-mode power supplies. Toroidal transformers are more efficient than the cheaper laminated E-I types of similar power level. Other advantages, compared to E-I types, include smaller size (about half), lower weight (about half), less mechanical hum (making them superior in audio amplifiers), lower exterior magnetic field (about one tenth), low off-load losses (making them more efficient in standby circuits), single-bolt mounting, and more choice of shapes. This last point means that, for a given power output, either a wide, flat toroid or a tall, narrow one with the same electrical properties can be chosen, depending on the space available. The main disadvantages are higher cost and limited size. A drawback of toroidal transformer construction is the higher cost of windings. As a consequence, toroidal transformers are uncommon above ratings of a few kVA. Small distribution transformers may achieve some of the benefits of a toroidal core by splitting it and forcing it open, then inserting a bobbin containing primary and secondary windings. When fitting a toroidal transformer, it is important to avoid making an unintentional short-circuit through the core. This can happen if the steel mounting bolt in the middle of the core is allowed to touch metalwork at both ends, making a loop of conductive material that passes through the hole in the toroid. Such a loop could result in a dangerously large current flowing in the bolt. 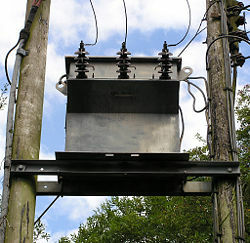 Transformer with two windings and iron core. Step-down or step-up transformer. The symbol shows which winding has more turns, but not usually the exact ratio. Transformer with three windings. The dots show the relative configuration of the windings. Transformer with electrostatic screen preventing capacitive coupling between the windings. The conducting material used for the windings depends upon the application, but in all cases the individual turns must be electrically insulated from each other and from the other windings. For small power and signal transformers, the coils are often wound from enamelled magnet wire, such as Formvar wire. Larger power transformers operating at high voltages may be wound with wire, copper, or aluminium rectangular conductors insulated by oil-impregnated paper. Strip conductors are used for very heavy currents. High frequency transformers operating in the tens to hundreds of kilohertz will have windings made of Litz wire to minimize the skin effect losses in the conductors. Large power transformers use multiple-stranded conductors as well, since even at low power frequencies non-uniform distribution of current would otherwise exist in high-current windings. Each strand is individually insulated, and the strands are arranged so that at certain points in the winding, or throughout the whole winding, each portion occupies different relative positions in the complete conductor. This transposition equalizes the current flowing in each strand of the conductor, and reduces eddy current losses in the winding itself. The stranded conductor is also more flexible than a solid conductor of similar size, aiding manufacture. For signal transformers, the windings may be arranged in a way to minimise leakage inductance and stray capacitance to improve high-frequency response. This can be done by splitting up each coil into sections, and those sections placed in layers between the sections of the other winding. This is known as a stacked type or interleaved winding. Both the primary and secondary windings on power transformers may have external connections, called taps, to intermediate points on the winding to allow selection of the voltage ratio. The taps may be connected to an automatic, on-load tap changer for voltage regulation of distribution circuits. 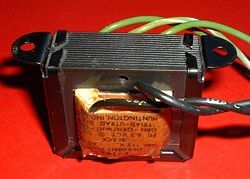 Audio-frequency transformers, used for the distribution of audio to public address loudspeakers, have taps to allow adjustment of impedance to each speaker. A center-tapped transformer is often used in the output stage of an audio power amplifier in a push-pull circuit. Modulation transformers in AM transmitters are very similar. The turns of the windings must be insulated from each other to ensure that the current travels through the entire winding. The potential difference between adjacent turns is usually small, so that enamel insulation may suffice for small power transformers. Supplemental sheet or tape insulation is usually employed between winding layers in larger transformers. The transformer may also be immersed in transformer oil that provides further insulation. Although the oil is primarily used to cool the transformer, it also helps to reduce the formation of corona discharge within high voltage transformers. By cooling the windings, the insulation will not break down as easily due to heat. To ensure that the insulating capability of the transformer oil does not deteriorate, the transformer casing is completely sealed against moisture ingress. Thus the oil serves as both a cooling medium to remove heat from the core and coil, and as part of the insulation system. Certain power transformers have the windings protected by epoxy resin. By impregnating the transformer with epoxy under a vacuum, air spaces within the windings are replaced with epoxy, thereby sealing the windings and helping to prevent the possible formation of corona and absorption of dirt or water. This produces transformers suitable for damp or dirty environments, but at increased manufacturing cost. Outdoor electrical distribution systems are subject to lightning surges. Even if the lightning strikes the line some distance from the transformer, voltage surges can travel down the line and into the transformer. High voltage switches and circuit breakers can also create similar voltage surges when they are opened and closed. Both types of surges have steep wave fronts and can be very damaging to electrical equipment . To minimize the effects of these surges, the electrical system is protected by lighting arresters but they do not completely eliminate the surge from reaching the transformer. The basic impulse level (BIL) of the transformer measures its ability to withstand these surges. All 600 volt and below transformers are rated 10 kV BIL. The 2400 and 4160 volt transformers are rated 25 kV BIL. Where transformers are intended for minimum electrostatic coupling between primary and secondary circuits, an electrostatic shield can be placed between windings to reduce the capacitance between primary and secondary windings. The shield may be a single layer of metal foil, insulated where it overlaps to prevent it acting as a shorted turn, or a single layer winding between primary and secondary. The shield is connected to earth ground. Transformers may also be enclosed by magnetic shields, electrostatic shields, or both to prevent outside interference from affecting the operation of the transformer, or to prevent the transformer from affecting the operation of nearby devices that may be sensitive to stray fields such as CRTs. 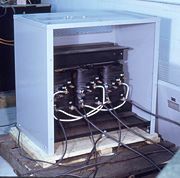 Three phase dry-type transformer with cover removed; rated about 200 KVA, 480 V.
Small signal transformers do not generate significant amounts of heat. Power transformers rated up to a few kilowatts rely on natural convective air-cooling. Specific provision must be made for cooling of high-power transformers. Transformers handling higher power, or having a high duty cycle can be fan-cooled. Some dry transformers are enclosed in pressurized tanks and are cooled by nitrogen or sulphur hexafluoride gas. The windings of high-power or high-voltage transformers are immersed in transformer oil—a highly refined mineral oil, that is stable at high temperatures. Large transformers to be used indoors must use a non-flammable liquid. Formerly, polychlorinated biphenyl (PCB) was used as it was not a fire hazard in indoor power transformers and it is highly stable. Due to the stability and toxic effects of PCB by-products, and its accumulation in the environment, it is no longer permitted in new equipment. Old transformers that still contain PCB should be examined on a weekly basis for leakage. If found to be leaking, it should be changed out, and professionally decontaminated or scrapped in an environmentally safe manner. Today, non-toxic, stable silicone-based oils, or fluorinated hydrocarbons may be used where the expense of a fire-resistant liquid offsets additional building cost for a transformer vault. Other less-flammable fluids such as canola oil may be used but all fire resistant fluids have some drawbacks in performance, cost, or toxicity compared with mineral oil. The oil cools the transformer, and provides part of the electrical insulation between internal live parts. It has to be stable at high temperatures so that a small short or arc will not cause a breakdown or fire. The oil-filled tank may have radiators through which the oil circulates by natural convection. Very large or high-power transformers (with capacities of millions of watts) may have cooling fans, oil pumps and even oil to water heat exchangers. Oil-filled transformers undergo prolonged drying processes, using vapor-phase heat transfer, electrical self-heating, the application of a vacuum, or combinations of these, to ensure that the transformer is completely free of water vapor before the cooling oil is introduced. This helps prevent electrical breakdown under load. Oil-filled power transformers may be equipped with Buchholz relays which are safety devices that sense gas build-up inside the transformer (a side effect of an electric arc inside the windings), and thus switches off the transformer. Experimental power transformers in the 2 MVA range have been built with superconducting windings which eliminates the copper losses, but not the core steel loss. These are cooled by liquid nitrogen or helium. Very small transformers will have wire leads connected directly to the ends of the coils, and brought out to the base of the unit for circuit connections. Larger transformers may have heavy bolted terminals, bus bars or high-voltage insulated bushings made of polymers or porcelain. A large bushing can be a complex structure since it must provide electrical insulation without letting the transformer leak oil. Small transformers often have no enclosure. Transformers may have a shield enclosure, as described above. Larger units may be enclosed to prevent contact with live parts, and to contain the cooling medium (oil or pressurized gas). ↑ William Flanagan. 1993. Handbook of Transformer Design and Applications. (New York, NY: McGraw-Hill. ISBN 0070212910). ↑ ENERGIE. The scope for energy saving in the EU through the use of energy-efficient electricity distribution transformers 1999 . Retrieved June 25, 2007. ↑ 5.0 5.1 5.2 5.3 5.4 M.G. Say. 1983. Alternating Current Machines, 5th ed. (London, UK: Pitman), 13-14. ↑ Nave, C.R. HyperPhysics Georgia State University, 2005; Retrieved June 25, 2007. ↑ John Hindmarsh. 1977. Electrical Machines and their Applications, 4th ed. (Exeter, UK: Pergammon), 142-143. ↑ 13.0 13.1 M.G. Say. 1983. Alternating Current Machines, 5th ed. . (London, UK: Pitman), 142-143. ↑ 14.0 14.1 John Hindmarsh. 1977. Electrical Machines and their Applications. (St. Louis, MO: Pergamon. ISBN 0080305733), 29-31. ↑ 15.0 15.1 15.2 15.3 Colonel William McLyman. 2004. Transformer and Inductor Design Handbook. (Warminster, PA: CRC. ISBN 0824753933), 3.9-3.14. ↑ 16.0 16.1 Lloyd Dixon, Eddy Current Losses in Transformer Windings and Circuit Wiring. Texas Instruments. Retrieved June 25, 2007. ↑ 17.0 17.1 17.2 Central Electricity Generating Board. 1982. Modern Power Station Practice. (St. Louis, MO: Pergamon. ISBN 0080164366). Central Electricity Generating Board.1982. Modern Power Station Practice. Oxford, UK: Pergamon. ISBN 0080164366. Daniels, A.R. 1985. Introduction to Electrical Machines|publisher. South Yarra, Victoria, Australia: Macmillan. ISBN 0333196279. Fitzgerald, A. 1983. Electric Machinery, 4th ed. Columbus, OH: McGraw-Hill. ISBN 0070211450. Flanagan, William. 1993. Handbook of Transformer Design and Applications. New York, NY: McGraw-Hill. ISBN 0070212910. Heathcote, MJ. 1998. J&P Transformer Book, 12th ed. Oxfod, UK: Newnes. ISBN 0750611588. Hindmarsh, J. 1984. Electrical Machines and their Applications, 4th ed. Oxford, UK: Pergamon. ISBN 0080305725. McLaren, Peter. 1984. Elementary Electric Power and Machines. West Sussex, UK: Ellis Horwood. ISBN 047020057X. McLyman, Colonel William. 2004. Transformer and Inductor Design Handbook. Warminster, PA: CRC. ISBN 0824753933. Neal, J.P. 1960. Electrical Engineering Fundamentals. Columbus, OH: McGraw-Hill. ASIN B000BSOZ66. (Sect 7-9 on mutual inductance, 301). Say, M.G. 1983. Alternating Current Machines, 5th ed. London, UK: Pitman. ISBN 0273019694. Shepherd, Moreton J, and A.H Spence. 1970. Higher Electrical Engineering. Nominet, UK: Pitman Publishing. ISBN 0273400258.